As I travel around the world, talking with girls and women about the tremendous opportunities for doing good while doing well in IT careers, I’m continually amazed by how few female students seriously consider studying computer science. Although the technology sector is poised for exponential job growth over the next several years, there’s a glaring lack of women entering the field. Since the 1980s, the number of computer science degrees awarded to women has steadily declined, to the point where women account for only 17 percent of computer science graduates in the UK today. You would think that employment prospects alone would make women consider tech careers, especially after the tough economic times we’ve been through. Let’s take a step back and look at the economics of the technology sector. In the UK, the technology sector has played a key role in helping the economy bounce back from the double-dip recessions of 2008-2009 and 2011-2012. It has, for instance, provided 30% of the jobs growth in London since 2009. Nationwide, employment in the IT industry grew 5.5% between 2009 and 2012, and it is up an astonishing 20 percent in London (more than three times faster than the sector average) since the recession. Today, more than 1.3 million people work in the UK’s technology sector. In fact, the job growth has been so intense that almost one in five vacancies in the UK digital sector go unfilled for want of qualified applicants. And this situation is likely to get worse: experts predict that half a million new entrants into the field will be needed within the next five years. In light of these huge opportunities, you would think female students would be eager to major in computer science. You’d expect computing course to be filled with enthusiastic young women, especially since female students now account for 55 percent of the enrollments in higher education in the UK (HESA 2013). Turns out, those expectations would be wrong. It pains me to point out that of the UK’s 403,000 higher education graduates in 2013, less than 3 percent received a degree in computer science—and, as noted earlier, women accounted for only 17 percent of that meager number (HESA 2013). The skills shortages of today will be magnified in the future. In addition, we have all heard about the gender gap between male and female wages, a disparity that stood at 18 percent in the UK in 2012. But according to a comprehensive survey by Dice, a 22-year-old website that specialises in tracking technology jobs, the gender pay gap has all but disappeared in the tech sector, at least in the United States, when comparing women and men with similar levels of education, experience, and job titles. It is reasonable to assume that market forces have levelled the gender wage gap in the UK technology sector as well. My male classmates underestimate my technical abilities and relegate me to project management or presenter roles in group projects. The scarcity of women on the computer science faculty makes me think this is not a welcoming field for women. The courses fail to make a connection between computer science and social impact. How can I fulfill my desire to solve big challenges by working in a field that seems to discount my talents? As I talk to these young women, I get an uneasy sense of déjà vu, seeing myself as a university student in the late 1990s. I wasn’t sure what career path I wanted to follow, but I knew I wanted to make a difference in the world. When I took my first computer science course—on Pascal—I found it maddeningly abstract. How, I wondered, is this related to making a difference in the real world? Moreover, I was put off by the fact that I was one of only two women in the class, and that the men seemed to immediately get it, thanks to their familiarity with concepts that were new to me. I was a top-performing student and a perfectionist, so I had a hard time accepting that it’s okay to fail—in fact, that failing is a big part of what computer science is all about. I found it beyond confusing. Ironically, at the same time I worked in the university’s IT department. I helped build the school’s firewall, taught classes and set up students’ personal computers, and even assisted in wiring the dorms for the Internet. I had no idea that what I was doing to pay the bills was computer science. I wound up majoring in mechanical engineering, mainly because a professor took an interest in me and allowed me to do research with robotics, through which I learned about prosthetics and how technology could help people with injuries or disabilities. At the time, I thought only mechanical engineers could make a difference. I was certain that computer science offered no such opportunities! So, okay, I was young and full of misconceptions. The problem is, those same misconceptions are still inhibiting talented women from pursuing degrees and careers in computing. That same demoralising and downright wrong message—that computer science isn’t for women—is still out there. We need to change the message. We need to show young women that computer science is the field to be in if they want to make an impact on society and help people. We need to make them realise that the latest advances in improving healthcare, protecting the environment, and upgrading manufacturing have come from technological innovations. We need to tell them that technology companies want to hire more women. Those companies recognise that breakthroughs require teams that are sufficiently diverse to anticipate, respond to, and serve the needs of a changing world. And studies reveal that executives value the variety of perspectives that comes with team diversity, yet another reason for needing greater female participation in computing fields. I am asking all of you to talk about the impact you make in your computing jobs and the difference students can make in this field. I am asking you to take an interest in young women, coaching and guiding them through their decisions, making sure they understand how much a career in computer science offers. So what is Microsoft Research doing to help change the message? Quite a bit. To bolster women’s participation in computing, we believe in a multipronged approach based on broad industry, nonprofit, and academic partnerships. This approach builds exposure to computer science at an early age and supports women during undergraduate and graduate studies in computer science. The courses a girl takes in secondary school and sixth form can play a key role in determining her path in university and beyond. It’s vital that these young students be exposed to the power of technology. To this end, we strongly encourage teachers and school administrators to take advantage of student-focused tools and programs provided by technology companies. For example, such Microsoft Research offerings as Kodu, .NET Gadgeteer, Pex for Fun, and Touch Develop build computing competence and confidence in girls (and boys). We also recognise that a student’s university education is more than just time spent in the classroom. We therefore support a variety of programs—scholarships, internships, fellowships, research opportunities, seed funds, and awards—designed to inspire young women to pursue technology as a career path. We also partner with a number of companies and organisations that demonstrate the same dedication to engaging women in computer science at all levels of their professional lives, from secondary school through university and into their careers. Notable partners include the Anita Borg Institute, ACM-W, IEEE-WIE, and CRA-W.
We further understand the importance of promoting collaborations between the top women researchers and rising female stars, as these ventures help the younger partners attain greater visibility—not to mention showing young women they are not alone and exposing them to the amazing differences that women are making in the computing field. Education does not end with graduation. 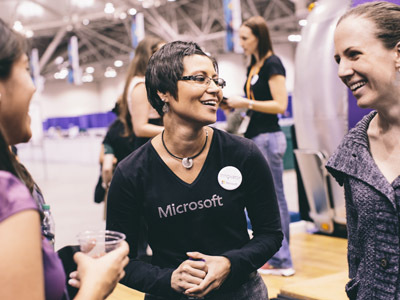 This holds especially true in technology, and it’s why Microsoft and other technology companies sponsor numerous events each year designed to inspire and educate women in the technology field. The industry also participates in such events as the annual Grace Hopper Celebration of Women in Computing, where we mentor and encourage women to reach their full potential in computing. Through partnerships with businesses, organisations, and individuals, we believe we can make a positive contribution to growing the next generation of women in computing. We will bridge the gap to future innovation together, through diversity and creativity! Join us! About the author: Rane Johnson-Stempson is Principal Research Director for Education and Scholarly Communication at Microsoft Research Connections. When she isn’t traveling the world to excite young women about careers in computing, she kicks back in Bend, Oregon, enjoying the natural beauty of her home in the Pacific Northwest.